PR and Review - Stay Cool This Summer with Parachute Advansed Body Lotion ! | The Shopaholic Diaries - Indian Fashion, Shopping and Lifestyle Blog ! PR and Review - Stay Cool This Summer with Parachute Advansed Body Lotion ! All my Indian friends might be knowing about Parachute brand since childhood, because ever since I got my lovely hair( which no longer look lovely ) my grandma used to apply a lot of PARACHUTE Oil on my hair regularly !! And even till now, she asks me to take proper care of my hair and use Parachute oil only ! And I agree with her, as this is so far the best oils I have ever used on my hair which helps keep them healthy !! proper moisutrization and care. Parachute promises just the same ! "As the scorching summer sets in, all new Parachute Advansed Body Lotion- Summer Fresh is the answer to keeping your skin refreshed and beautiful all day long. A coconut milk based body lotion infused with cool and tingling mint extracts to keep your skin refreshed and rejuvenated in the summer heat. What’s more – it also gives your skin double protection against the sun rays with its UV A & B base protection. Parachute Advansed Body Lotion- Summer Fresh penetrates deep into your skin & refreshes it to get the soft and revitalized look through the summer! While we may not realize it, our skin loses a lot of moisture during the summer months, diminishing its freshness and softness & making it vulnerable to sun-tan. Summers in essence, is a harrowing time for your skin – and it goes through multiple skin screams – summer heat, dehydration, tanning, stickiness, and bad odour. This is when it needs that burst of moisture more than ever. All new Parachute Advansed Body Lotion- Summer Fresh has identified the need for a one-stop solution for all these multi-dimensional summer screams. The mint extracts provide an instant cooling on skin and refresh it after a hot summer day, coconut milk infuses light moisture to soften skin and keep it supple. Its bloom of refreshing and long lasting fragrance lingers on to give a invigorating feel for longer. Moreover, the double sunscreens provide double protection from sun. The result is refreshed, hydrated, healthy skin that is soft to touch all summer long. So, welcome the summers with Parachute Advansed Body Lotion-Summer Fresh as it offers your skin a cooling & fresh experience all summer long! " The lotion is very light and gets absorbed into the skin very easily and moisturizes my skin perfectly without it making it too oily or greasy. Has a mild, fresh fragrance which lasts for atleast 3-4hours- I really liked it ! The price is very affordable and apt according to the quantity ! Have you tried it out yet? What are your views about it? Let me know in the comments below ! Hi Nikita, thanks for the post. 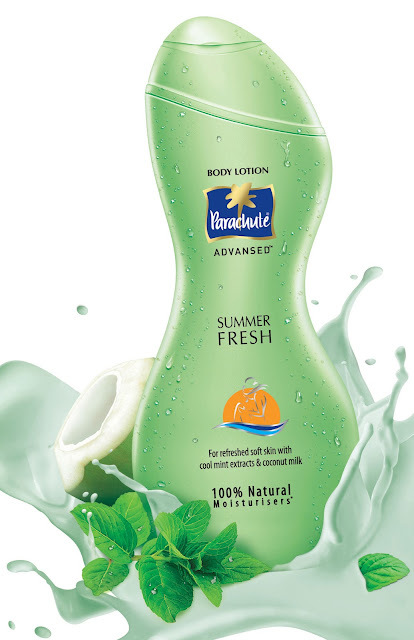 I also have been using Parachute advansed body lotion summer fresh because of the natural contents in it. I am loving it and always apply it whenever my skin needs it. Nice post Nitika, You reflect your true Delhite in this post. There is new blog about women shopaholics that I would like to share.